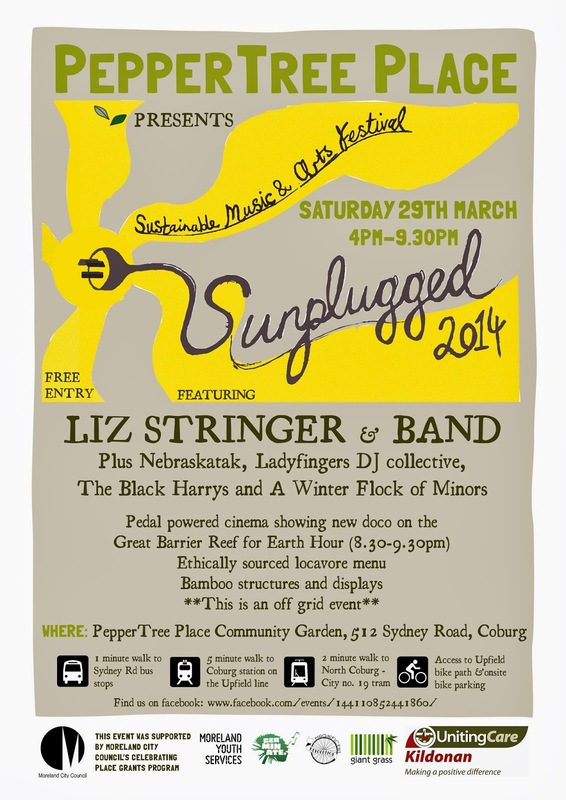 Coburg will come to life this Earth Hour with PepperTree Place’s ‘Sunplugged’- a music and arts festival which celebrates sustainable living, food production and alternate technology in Melbourne’s northern suburbs. Supported by Moreland City Council’s Celebrating Place Community Grant, this inaugural event will feature live music performances, food production talks, information stalls and displays, a sustainable technology hub, an interactive art installation and organic food stalls selling zero-food-mile delicacies. Local musicians will include the likes of acclaimed singer songwriter Liz Stringer, indie-pop specialist Nebraskatak, The Black Harrys, musical duo A Winter Flock of Minors and the all-girl Ladyfinger DJ Collective. Hands on workshops on harvesting and cooking unusual edibles, composting and talks bringing you up to date on local Food Politics and the joys of working with bamboo. Help keep Sunplugged off the grid by putting your energy in motion with the Magnificent Revolution pedal powered cinema. Explore the plight of the Great Barrier Reef with a special screening of Earth Hour documentary - Lights out for the Reef from 8:00pm. In the lead up to Sunplugged, make sure you stop by the junction of Sydney Road and Bell Street for the Corner Copia project. Supported by the Coburg initiative, Corner Copia will be open from the 24th through to the 29th March. Come Play Me I'm Yours piano installation free to the public for tinkling in the upcycled vertical garden. Get your hands dirty and help grow this interactive art park. Travel by public transport - arrives at our door or ride your bike. This is a family friendly event, drug and alcohol free.